A nice grouping of two items from George Washington's Revolutionary War headquarters in Newburgh, New York. The first item is a CDV of Washington's headquarters. I can count at least four cannons sitting out in front of the headquarters. 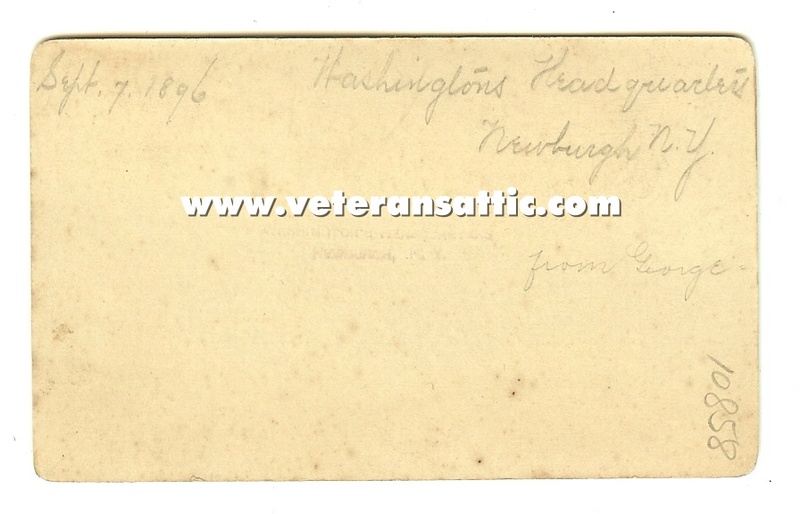 Written in pencil on the back of the CDV is "Sept. 7, 1896 - Washington's Headquarters - Newburgh, N.Y. - from George". The complete photograph is approximately 4 inches by 2 1/2 inches. The second item is a beautiful badge with Washington's headquarters on the middle of the badge. Written on the badge is gold is "Truth Separate Co.- N.G.S.N.Y. 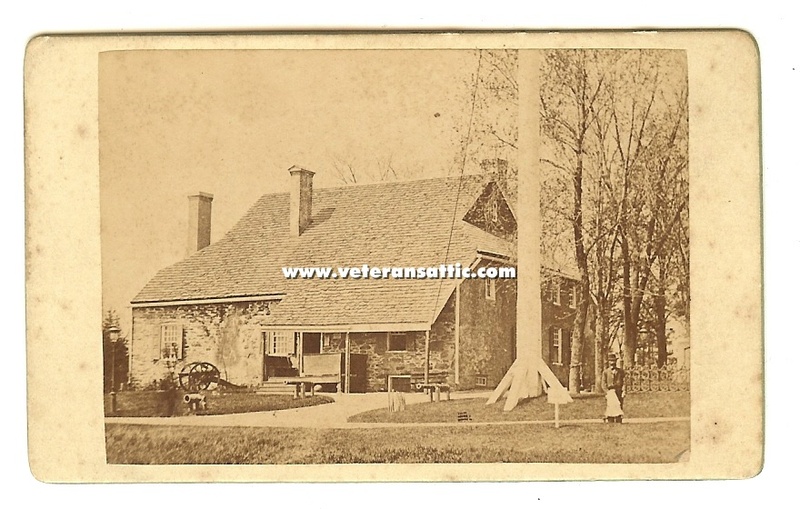 (National Guard State of New York) - Newburgh Centennial - 1783 - 1873 - Washington's Headquarters, Newburgh, N.Y. - Putnam Phalanx". A very nice Revolutionary War related grouping! As the national rebellion began, Newburgh organized a Committee of Safety, which governed the community for the duration of the war. Hundreds of troops were encamped here, especially near the end of the war. The war caused the region to burgeon, especially with the addition many settlers fleeing the British-occupied New York City. A strategic spot for the defense of the young nation, Newburgh has been called the "birthplace of the republic." General Washington not only guided the war from here but kept the dream of a republic alive by quelling a military rebellion and probable martial law and refusing to accept a crown as America's first king.